Harker’s basketball camp knitted together drills, five-on-fives and skills games to best engage students. The camp had two sessions per day: a morning session for boys in grades 6-9 and an afternoon coed session for grades 4-8, and was run by Harker varsity basketball coach Mark Collins, who spent 10 years in Denmark as a professional player and six years as the director of the Golden State Warriors camp. Each session at camp started with footwork drills, “just to get the blood pumping,” Collins said. Students then went to different stations for different skills, including passing, ball-handling, shooting and defense. “We do a lot of break-down drills so that we get specific with the type of drill that we want the kids to learn,” said Collins. 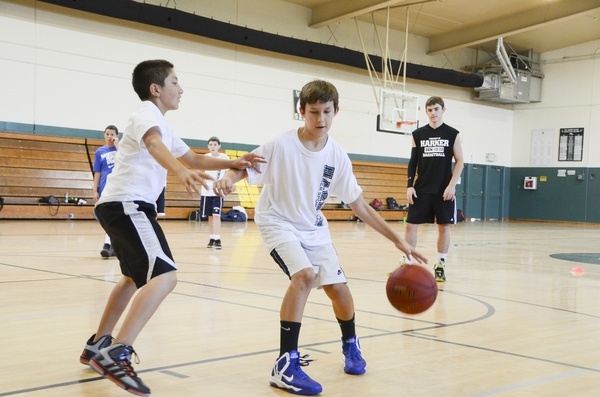 Students play five-on-five games to apply the skills and principles learned in the drills. Each session also featured fun games to liven up the atmosphere. In one of these games, a student’s name was randomly drawn from an envelope, and from a different envelope another slip of paper was drawn with an activity written on it. “This particular game is really fun for the kids, because it could be anything from ‘make a shot with your eyes closed’ to ‘make a shot backwards,’” Collins said. At the end of each day, students were given a homework question so that their minds would be engaged when camp started the next day.